Winter is well on its way, this is an ideal time to take a look at your skin care routine so improvements can be made for the cold weather season! During warmer weather, we tend to drink more water, eat more fresh fruit and salads, and take better care of our skin to protect ourselves from the higher temperatures and the damaging sun rays. Then winter comes along…and it’s all change! We retreat into ourselves a little more, perhaps to seek some comfort from the cold, and in doing so, our health, skin care, and fitness routines can suffer a little. The cold weather is not friendly to our skin, it can very quickly lose moisture and begin to feel dry and look very lackluster. Choosing skin care and cosmetics that help to hydrate, balance and moisturize your skin is of great importance; having healthier skin protects you by supporting your immune system, but it also boosts your confidence- because our skin is the first thing that the world sees of us, and what we see of ourselves. Many skin care creams and lotions contain harmful chemicals and preservatives that can play havoc with our skin- even more so if you have a sensitive skin type or are prone to skin conditions like acne, or eczema. The main thing to remember when buying into any product is to check the ingredients first for how they will benefit you and your body. Natural products sourced organically are much kinder to your skin, your body, and the environment, and luckily, there are plenty of these types of products to choose from in our health-conscious day and age. Era Organics was inspired to bring natural products to you that you can truly feel confident using. Here’s how they can help you for better skin through winter, and beyond! Era Organics products are non-toxic, non-allergenic, and cruelty-free. They provide natural skincare options that are lovingly made with mostly organic, food-grade ingredients. Ultimately, if it shouldn’t go into your body, they won’t put it on your skin! Whether you have a condition like eczema, psoriasis, or dermatitis or something completely different, Era Organics have a product that can help. “We make all of our products with damaged, sensitive skin in mind. This means Era products don’t contain harsh chemicals, perfumes, dyes, parabens or toxins. We have complete confidence in our products. As a family owned and operated the company, we want to help in any way we can to make each of our customers have a miraculous success story, just like so many before them”. Growing up, Tyler, the owner of Era Organics, had a lot of skin issues like severe acne, eczema and even painful outbreaks of shingles. Having tried everything under the stars, he eventually gave up and stopped his entire routine because nothing worked. Funnily enough, that’s when his skin started to clear up. This was his first clue that the products available were doing more harm than good, and that there must be a better solution out there. He started researching the skin, its functions, and properties. The first important thing he learned was about pH levels. He found out that your skin naturally sits at 5.5 pH. Essentially, maintaining these levels sets the foundations in place for a more successful journey toward healthy skin. The problem with most skin care products is that they can be up to 8-10 pH. To put that into perspective, bleach is around 12pH! Constantly throwing off your skin’s pH levels not only makes healing difficult but it also weakens your immune system’s first line of defense- your skin acts as a protective shield against harmful toxins and invaders, and so it needs your unflinching support! Tyler started looking for natural ways to feed skin the vitamins, minerals, enzymes, and other nutrients it quintessentially requires while maintaining proper pH balance. This would provide the ideal environment for the skin to heal, hydrate and stay balanced. It’s what led to Era Organics’ first product. To formulate Complete, Era Organics consulted with doctors, nutritionists, specialists and a chemist who had over 20 years of experience. 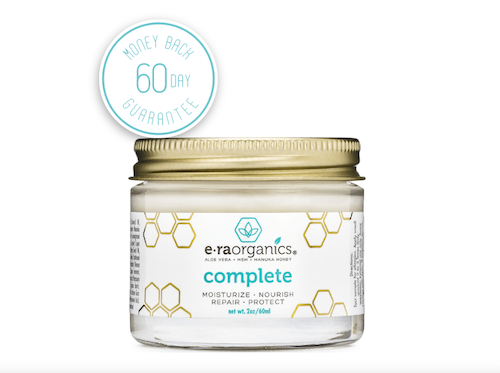 They called it Complete because the 10-in-1 formula combines to feed your skin all the major vitamins, minerals, amino acids, and enzymes your skin needs. This moisturizer contains natural ingredients like Aloe Vera, Manuka Honey, MSM, Blue Green Algae, and more. It doesn’t contain any harsh chemicals and is perfectly balanced at 5.5 pH. It penetrates seven layers deep, providing your skin with all the vital nutrients it needs to heal and rejuvenate, and thereby giving your skin a remarkable look and feel. It has drastically helped people with dry and oily skin, acne, eczema, rashes, and even wrinkles. Most exfoliators rip and damage your skin. Era Organics microdermabrasion is different, it’s an exfoliating cleanser that gently loosens dirt, grime, and dull skin while nourishing your cells- leaving healthier, glowing skin. It means you get a softer, beautiful, more youthful complexion in minutes! You can leave it on to use as a natural anti-aging facial mask to balance your skin tone, reduce wrinkles and age spots. 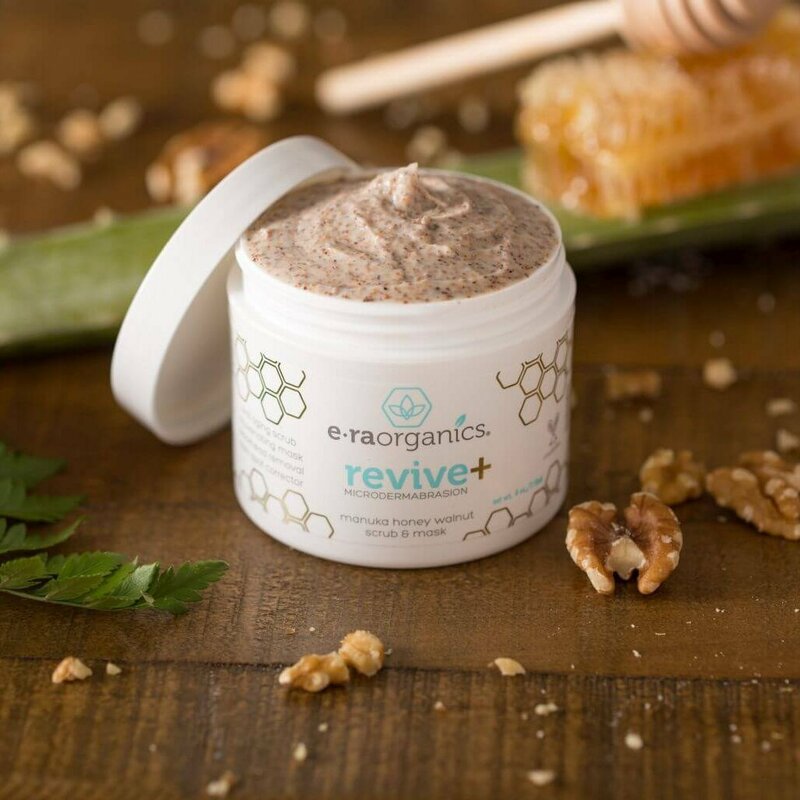 Revive contains Manuka Honey, Aloe Vera, Rapeseed Oil, Walnut, Orange Peel and more. Era Organics ingredients are proven to heal and restore while hydrating to the base of the skin. Era Organics are confident in what they offer and how they can help you to better, healthier looking skin. To prove that to you, each order is backed by a no questions asked 60-day guarantee. They know you’ve probably tried dozens of products that didn’t work… Era Organics want you to have full confidence when trying out their products. Era Organics goal is to make safe, natural products using ingredients that are scientifically proven to work…confident buying toward confident beauty! *In partnership with our friends at Era Organics.